These kunda buds shine with a glistening sheen as if stars, terrified of the cold, have taken refuge in the kunda creeper. 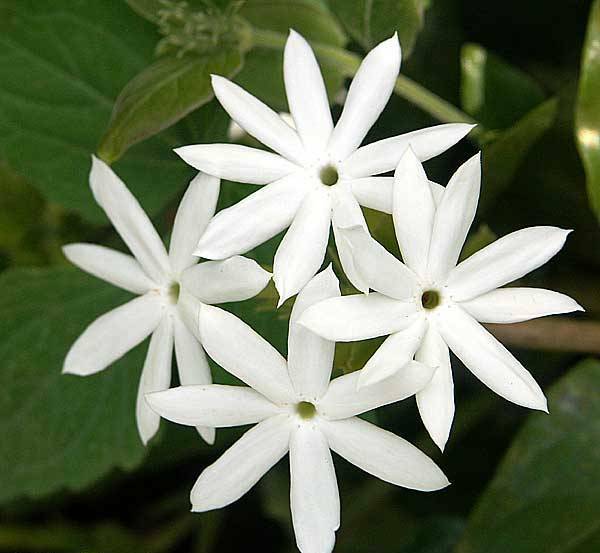 The kunda is one of the many forms of jasmine found in India, identified as Jasminum Multiflorum or Jasminum Pubescens. It is a creeper with small white flowers, proverbially white along with other favourites of poets like the moon and snow. And like foam, and any white object, flowering kundas represent laughter. The grounds, enchantingly lit up with kunda flowers white as the laugh of women at play, distract even the ascetic who has renounced all human affection – how much more ordinary men tainted by passion. Blooming in śiśira, the kunda withers at the onset of spring and is indeed one of the signs of the imminent change of season according to the Kāvyamimāṃsa. (Although as the verse above shows, kundas are still knocking around in vasanta in the Ṛtusaṃhāra and they also feature twice in the description of the resplendence of vasanta at the Pampa Lake in the Ramayana.) Bees, traditional lovers of the lotus, flock to the kunda and mourn for the departure of its blooms. Oh kunda, this young bee, wild with mead, spends his nights with you. Even so the heartfelt agony of being separated from the padminī (lotus) does not subside. Kunda is sometimes referred to in Sanskrit as sadāpuṣpa, and is known in Hindi and Bengali as kunda or kundaphūl, Marathi as mogarā or kastūrī malige and Gujarati as ḍolar, kunda kāgaḍo or mogaro. In the south, it is called makarantam or mallikai in Tamil and kurukkuttimulla in Malyalayam. A large scadent tomentose shrub, leaves simple, ovate, flowers white, slightly fragrant, sessile in dense terminal capitate cymes, fruits black, globose berries, growing throughout India, in the forest of Western Ghats and sub-Himalayan tracts. I have this variety of jasmine, yes, the flowers when in full bloom is very beautiful. First if all, I did nit even know its name!! As it was’nt fragrant, I could’nt believe it to be jasmine, but early morning just at sunrise it emits very delicate fragrance. Now I will try and train it to be more beautiful vine. I even know, NOW, that its sanskrit name is KUNDA. Thanks. I am wiser now.